I have an aversion to certain food smells. It’s a violent reaction that starts with just the package opening and sends me over the edge. And, if Jacob even thinks of eating either of the two foods – it’s a no-go for hugging, let alone smooching. The two things are red vines and Doritos. The problem with these two things is Jacob LOVES them! They are his choice of snack if he’s making a mad-dash into a convenience store or is doing the shopping for a camping trip. Well, Jacob’s affinity for these two foods was taken care of when we started thinking about artificial colorings, additives and junk-laden foods. The love wasn’t worth the exposure and possible risk from the chemicals. But, we’ve – well, Jacob has – brought one of these snacks back into our house. And, it’s all natural with organic ingredients and the same delicious taste that is reminiscent of the old florescent orange chip he used to gobble down. 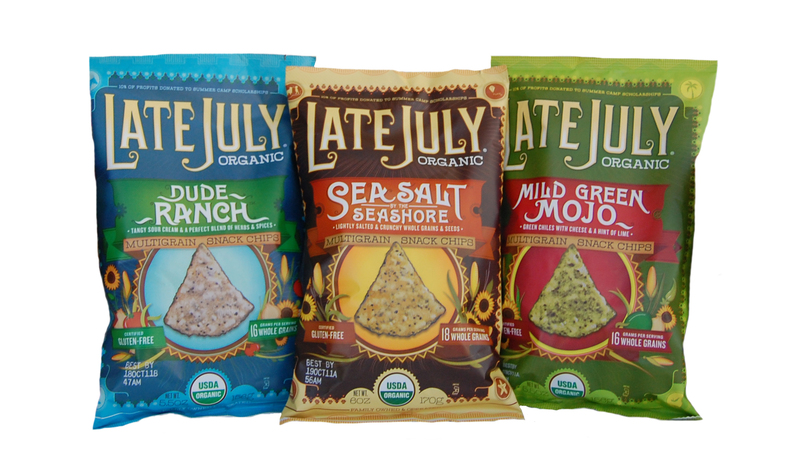 Late July is a company known for making organic snacks. And, they are delicious! Some of their organic offerings resemble the chemical-filled classics, but they also have an incredible line of unique products that are just their own. Our new favorite is their Multi Grain Snack Chip. The three different offerings are the Mild Green Mojo, Seasalt Seashore and Dude Ranch. The Dude Ranch is Jacob’s personal favorite. It’s has all the flavor punch of a classic snack chip, but is all natural. There are no crazy colors or ingredients you can’t pronounce. Instead they are packed with organic ingredients, whole grains and a hearty oomph that satisfies your hunger instead of just giving you a bite size teaser of a snack. I love that Late July has brought organic alternatives to classic snacks and has an entire line of creative one-of-a-kind treats, too. Jacob and I miss some of the snacks from our pre-greenie life and I like that Late July satisfies the craving. Late July is a family run company who cares about getting healthy foods into kids, but keeping it fun, too. You can’t beat their selection and high-quality organic ingredients. Where to buy? Check out Late July’s website for locations. I purchase them at our Community Co-op grocery store and Haggen. Get socially connected: Follow Late July on Facebook and Twitter. Want to stock your pantry with healthy snacks from Late July? Interested in entering the giveaway? Comment on this post and tell me: What is your favorite snack? Winners will be drawn on Tuesday, October 18th at 8:00pm PST. This entry was posted in nice & natural, oh! it's organic!, supper & sustenance. Bookmark the permalink. String cheese, or pita chips and hummus! My absolute favorite snack is probably…popcorn. Even though I’m always starving 20 minutes after eating it, I do love it! I like apples with peanut butter. My favorite snack is probably chips, yogurt, or fair trade chocolate . Grapes for me! But chips are a huge thing for lunches in our home. I would love to find a good replacement! One of my favorite snacks is (organic) blue corn chips and salsa. chips always hit the spot for me! Chocolate is my absolute favorite snack! Chocolate covered nuts! I like Sacred Bee on Facebook! I like Late July Organics on Facebook! I follow Late July Organics on Twitter via @chicmommatoni! I follow Sacred Bee on Twitter via @chicmommatoni! My current favorite snack is home-made popcorn with sunflower oil. I follow you on Twitter and tweeted about this giveaway at https://twitter.com/#!/likwan/status/126489054631047168. I shared this giveaway on Facebook at https://www.facebook.com/likwan/posts/206309959441461. I follow Late July on Facebook under the username likwan. I follow Late July on Twitter under the username likwan.